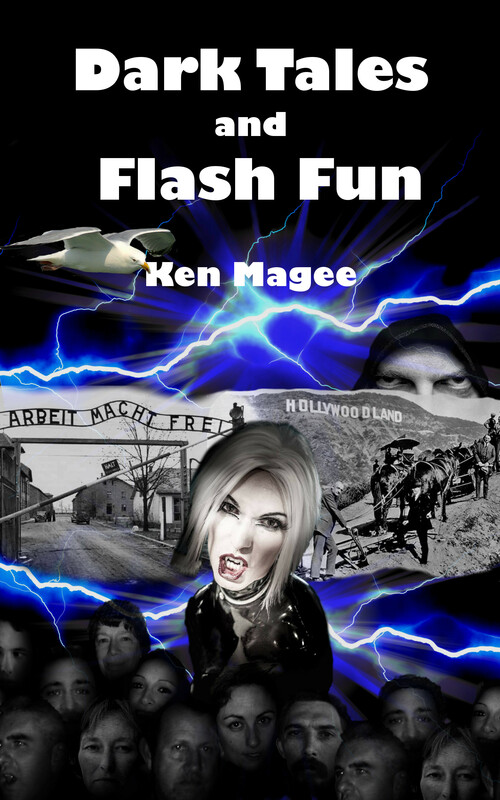 Dark Tales and Flash Fun brings together my extensive collection of drabbles (100 word stories) with three short stories I wrote for other publications. And, to celebrate it's release... it's free. In this anthology of wonderfully imagined tales we encounter captivating twists and turns, laugh out loud moments and intriguing entertainment from start to finish. The subject matter includes demons and vampires, Hollywood and electric chairs… there’s even a seasick seagull. My knuckles tensed white as I gripped the bridge’s outer railings. The wind lifted my hair and the crashing sound of rushing waters, hundreds of feet below, assaulted my ears. Thoughts of numerous pathetic attempts filled my brain. I leaned forward and let go. I accelerated earthward as gravity took a hold. Terror engulfed me but serenity quickly replaced the fear. Ironically, I’d never felt so alive. ‘The bungee rope should tighten soon’ was the last thought I ever had as my face smashed into the freezing water. “Today, Beth and Steve join us on the show,” announced the host, a cheesy grin spread like Dairylea across his face. “So here are the results...” he opened the gold envelope. Author’s Note. It never ceases to amaze me how willing some people are to air their dirty laundry on national TV. Here's another drabble from the book. Author’s Note. As one (female) reader pointed out, all he had to do was say the present was in fact for his wife... no woman would ever say that he'd bought the wrong size, particularly not a size too small! So there's the proof, if proof were needed, that women are much smarter than men. The first headline to catch my eye stated ‘UK is Slipping Down Global League Tables in Reading and Geography’. Apparently we’re languishing twenty places behind Estonia. It appears that few of our children would understand ‘languishing’ nor could they pinpoint Estonia on a map. The next headline read ‘Overuse of Antibiotics is a Ticking Time Bomb’. Bacteria are cleverly adapting and becoming resistant to the drugs. The growing resistance poses a bigger danger to the nation than terrorism. Depressed, I stopped reading, it seems our kids are getting dumber, bacteria are getting smarter… this is not going to end well. I bob up and down, rather majestically, on a wave. Up and down. Baaaaaaarrfff. There I go, sick again. This is ludicrous. I’m constantly seasick and I’m supposed to be a SEA-gull, for goodness sake. I can’t take this anymore. There’s nothing else for it. I spread my wings and start my funny little run across the top of the water. Eventually, I lift off gracefully before the next wave swooshes in. I climb steadily up into the clear blue sky and soon catch a warm air current. I soar, rather majestically, above the hateful ocean. Another drabble from Dark Tales and Flash Fun... and the book's free at the moment. Last night’s storm had littered the beach with thousands of starfish. Ahead of me a young boy stopped occasionally to throw one back into the ocean. “They’ll die if left on the sand,” he told me when I caught up. “There are too many, you’re not going to make much of a difference,” I said. He hadn’t seen the seals which were catching and eating every one he threw. I hadn’t the heart to tell him. He was too young to have his idealistic dreams crushed.